There's no split-screen campaign co-op in Ghost Recon: Future Soldier. Regardless of what several retailer sites, including Ubisoft's own UbiShop, might tell you. The back of the game's box does indicate that there is split-screen co-op, and technically there is, in the game's take on horde mode: "Guerrilla." Unfortunately for Ubisoft, the sites in question specifically mention split-screen campaign co-op. 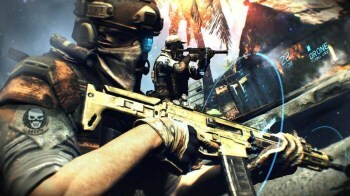 "We've been made aware of the presence of outdated information on UbiShop and several retailer sites stating split screen, cooperative play is available inÂ Ghost Recon: Future Soldier's campaign," Ubisoft forum manager EvilPixieGrr said in an update onÂ the publisher's forums. "We have ensured the information has been updated on the sites affected by this." "Our customers are extremely important to us, and we hope you'll accept our sincerest apologies for any inconvenience and frustration caused by this miscommunication," the message continued. So, sincerest apologies are being offered, help yourself, but the message doesn't mention whether or not Ubisoft will be offering refunds to players who picked up the game specifically for split-screen co-op. When presented with a similar situation, Microsoft offered refunds to SDTV owners who bought Minecraft: Xbox 360 Edition, only to find out the game's split-screen mode was only available on HDTVs.